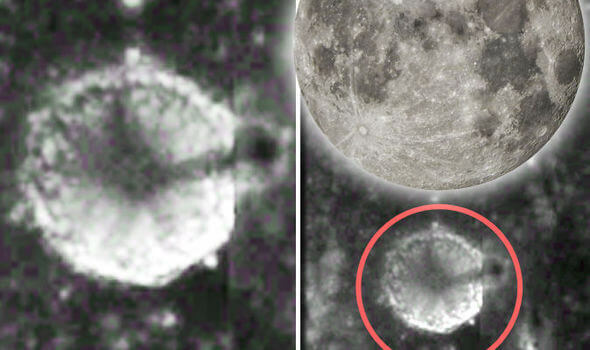 UFO hunters claim to have found evidence that backs up a 48-year-old myth that there is a massive unnatural spire bursting out from the surface of the moon. Alien chasers have posted a video to YouTube which says the “spire” was found using Google Moon – a version of Google Earth that allows users to explore the lunar surface.YouTube channel Mexicogeek made the discovery and posted the video, which has been pounced on by Scott C Waring, editor of UFO Sightings Daily as proof of a myth dating back to the original moon landings.He posted: “This is the legendary spire on Earth’s moon.”It’s been seen before in 1967 Orbiter 3 photos.”This spire is 3.64 miles tall according to Google ruler, but it is only an estimate.”It may be off as much as half a mile more or less.”UFO hunters have debated since 1967 what a number of so-called anomalies in NASA images of the moon could be.Mr Waring appears to be referring to an object that has become known as the Shard in the 1960s pictures. On Richard Hoagland’s Lunar Anomalies website, he said: “Poor resolution images like this one of the “Shard” have led some to conclude it is an ephemeral “outgassing” event. That would mean the sudden release of a volatile gas from within its surface.He added: “However, the Enterprise Mission enhancements reveal no ‘spray’ or splatter which would be consistent with such a conclusion. “The object appears to be solid, though badly battered by meteors.”However, he offers no opinion on what it may actually be.Enterprisemission.com, another website dedicated to space anomalies, estimated the shard at mile and a half tall.It said: “This highly anomalous bowling-pin shaped upright lunar feature defies all current geological models. Mr Waring has taken this theory a little further. He said: “The spire looks to be coming out of the centre of a crater, but these are not craters, but many small white shiny structures. His theory got mixed reviews on his website, with some slating them to those of a young child. Some readers pointed out that the 3-D like effect of the images appears to be right at the point where a line runs from the top to the bottom of the picture. Google has to “bolt” images together like this to create its full 360 degree satellite maps, so says occasional anomalies and optical illusions will occur. Chris Raymond added: “Many towers and ‘Allen bases’ are actually flat patterns that can be imagined as a 3D object. But Amanda Simko was impressed. She said: “So are these new images of the spire in the exact same place as the previous lunar orbiter pictures? “Why does it look so uniform in the new pics and all blurry and splotchy in the older ones?